Wayne Rooney struck twice and missed a penalty as Manchester United eased to victory against nine-man Aston Villa. Gabriel Agbonlahor headed Villa into an early lead, but Rooney's two composed finishes put United in front. Craig Gardner's own goal gave United a third before half-time, and Nigel Reo-Coker was sent off on the hour. Keeper Scott Carson followed for a foul on Carlos Tevez, and even though Stuart Taylor saved Rooney's spot-kick, Ryan Giggs added a deflected fourth. United boss Sir Alex Ferguson rested Cristiano Ronaldo and gave fellow countryman Nani a place in the starting line-up. Villa opened brightly and were ahead in the 11th minute when Ashley Young retrieved Gardner's dangerous centre and crossed for Agbonlahor to flick a header beyond Edwin van der Sar. Tevez and Rooney looked a dangerous combination, and Carson did well to block the Argentine as the pressure mounted. But it took a lapse of concentration from Villa defender Zat Knight to allow United to draw level after 36 minutes. 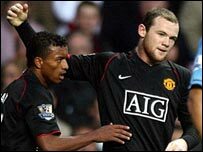 Knight inexplicably allowed Nani's cross to drift across the face of goal, and Rooney arrived at the far post to score with a simple side-footed finish. And Knight was again at fault as Rooney put United in front two minutes before half-time, getting caught out of position as Tevez's clever pass played in the England striker for a composed strike past Carson. United's ended the first 45 minutes by adding a third, courtesy of a moment of calamity in the Villa rearguard. Gerard Pique's header was cleared off the line by Young, but when Rio Ferdinand reacted first, Gardner could only lash his attempted clearance into his own net. Villa boss Martin O'Neill made a double change after 52 minutes in an attempt to revive his side's hopes, sending on Shaun Maloney and Isaiah Osbourne for Gardner and Luke Moore. But they suffered a blow seven minutes later when Reo-Coker, who had already been booked, was sent off by referee Rob Styles for a late tackle on Anderson. And matters became worse after 66 minutes when Carson upended Tevez as he looked poised to score, leaving referee Styles with no option other than to show his second red. Reserve keeper Taylor came on, and made a significant contribution with his first touch, diving to save Rooney's penalty. Rooney then struck the bar from Wes Brown's cross as United threatened to run riot. It was in danger of becoming a very messy evening for Villa as United added a fourth with 16 minutes left. Giggs jinked his way into the Villa penalty area and his shot took two deflections before looping past Taylor. "He's made two fouls in the game and he's not helped by how the players have rolled over afterwards. "I think the referee will realise it's very harsh. He'd been doing well up till then but I don't know where he's got it from." "We conceded some poor goals but were always in the game." "The performance was absolutely superb, probably our best of the season." "The first half in particular was absolutely excellent. "It's been disappointing we haven't scored more goals and that was a big surprise considering the players we've had available." Aston Villa: Carson, Mellberg, Knight (Taylor 67), Laursen, Bouma, Gardner (Maloney 53), Reo-Coker, Barry, Young, Agbonlahor, Moore (Osbourne 54). Subs Not Used: Davies, Petrov. Sent Off: Reo-Coker (60), Carson (66). Man Utd: Van der Sar, Pique, Brown, Ferdinand, Evra, Nani, Anderson, Scholes (O'Shea 77), Giggs (Ronaldo 76), Tevez (Fletcher 73), Rooney. Subs Not Used: Kuszczak, Simpson. Goals: Rooney 36, 44, Ferdinand 45, Giggs 75.